Tall palm trees and yet no coconuts.....is there a problem? Often times, the coconut palm will appear to be mature when in reality it is not. In general, these palms will flower in 4 to 6 years. They may not actually produce fruit, however, until they are 6 to 10 years old. And if growing conditions are unfavorable, they may not produce until they reach 15 to 20 years of age. Full production is at 15 to 20; they can potentially produce until they are about 80 years old. Although coconut palms are tolerant of dry soil conditions, for optimum fruit production regular irrigation is recommended, especially during drought conditions. Palms can also endure temporary waterlogged soil conditions but will decline and even die when exposed to prolonged periods of wet, poorly drained soil. Coconut palms will tolerate saline water and soils, as well as salt spray, but this does not mean that they prefer it. 10-10-30. Organic mulch and fertilizers are good and highly recommended. Overrun with toads and frogs in your yard? Having found no control manual for toads and frogs, the common sense approach would be to change the garden habitat to make it unfriendly for them. This will include eliminating water sources for their reproduction and moist areas for them to hide – almost an impossibility in areas of heavy rain! But eliminating piles of yard rubbish and trimming back thick ground cover will help. Various types of barrier-fences can be erected either around the property or just around certain desired areas. Since toads and frogs eat insects, controlling the bugs would also be a way of discouraging their presence. Eliminating any outdoor lighting, which attracts many insects, should help. In case you’re interested, and for clarity, all toads are members of the family Bufonidae, which in turn falls under the order of Anura, commonly called frogs. So, all toads are frogs, but not all frogs are toads. Toads tend to have a thicker skin allowing them to live away from water longer than most frogs. 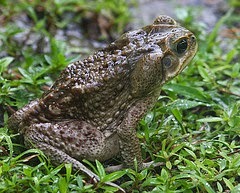 A toad’s skin is often covered with bumps and glands. The similarities are that frogs and toads both reproduce and develop in water, both ‘sing’ and both are carnivorous. Of note, when the bufo toad is attacked, its defense is to exude a milky fluid known as ‘bufotoxin’. This poison protects it from predators, but not all. Most snakes and birds seem to be unaffected. Humans need to be careful since the toxin may cause skin irritation and possibly worse, but there are no reports of human fatalities. Unfortunately the toxin can be fatal to small animals such as cats and dogs. 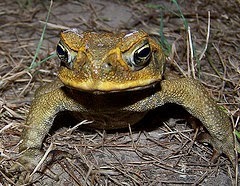 Thus ridding the yard of bufo toads is a protection for your pets. There are many approaches when dealing with diseases in the garden. I will go through a number of them and then tell you the very first step you need to take. A. Cultural control – Grow healthy plants. Stressed plants are more susceptible to diseases and insects too. Keep plants well-nourished and watered. Sanitation is a part of cultural control – keeping the growing area clean of diseased plant residues. Crop rotation is also used for controlling soil borne fungi attacking plant roots. B. Physical and mechanical control – this involves the removal of diseased leaves or an infected limb and disposing of them properly. At times, the entire diseased plant will need to be removed from among the many healthy ones. In high rainfall areas, foliar diseases, especially on tomatoes are common. The disease can be minimized by placing a 'roof' over the crop. This will restrict the rain that would normally spread the disease by splashing the fungal spores from leaf to leaf and plant to plant. C. Biological control – utilizing certain good fungi, bacteria and other microorganisms to feed on and destroy plant pathogenic fungi, bacteria, etc. This method is not as widespread in managing diseases as is in combating insect pests. D. Chemical control – probably the best all-around material for the control of foliar fungal and bacterial disease is the application of a copper based pesticide. This material is used as a protectant rather than eradicating the disease. All of the above methods should be in the gardener’s arsenal for controlling disease in the garden. The best approach, however, is to begin by using resistant varieties. Cultural, mechanical, physical and chemical methods require work and in many situations money. The one simple step that may negate all the leaf pulling, cleaning, building and spraying is to begin with seeds that are resistant to the disease in question. Check with seed companies to see if resistant seed is available. This approach applies nicely to the vegetable garden, and when planting fruit trees or even some ornamental, there are varieties that are immune or less prone to certain diseases. To that end I would like to direct you to the Cornell University Vegetable MD online. Go to http://vegetablemdonline.ppath.cornell.edu/ and click on the Resistant Varieties on the sidebar. Here you will find a list of vegetable crops – from beans and cabbage to squash and zucchini. Choose the crop you are interested in and up comes an excellent chart listing the numerous crop varieties and their resistance to various diseases and physiological disorders. Most importantly, the seed companies which sell the specific variety are noted. Search the phone number or website for the specific company and order your seeds. Planting resistant varieties will go a long way in making life simpler in the garden. Note: the word ‘resistant’ means just that; it does not mean immune! It can also mean that in tests, the resistant variety simply did better than nonresistant varieties. Spending a little time before you plant will save you lots of time and money afterwards. Powdery mildew (PM) is a menace to many gardeners. 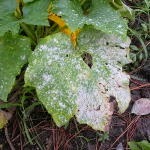 The disease will turn large zucchini leaves white and later brown. A whitish cast will appear on many common garden plants such as tomatoes, beans, cucumbers, mustard, peas, and collards. Infected leaves often turn yellow to brown and may shrivel making the plant unproductive and eventually die. The white fungal growth can develop both on the upper and the lower surfaces of the leaf, and sometimes, on flowers and fruit. 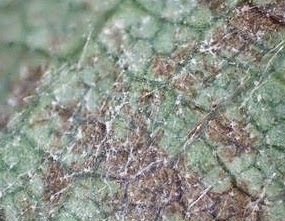 The cottony like threads of this fungus travel along the surface of the leaf, occasionally sending “roots” down into the leaf tissue in order to obtain nutrients. 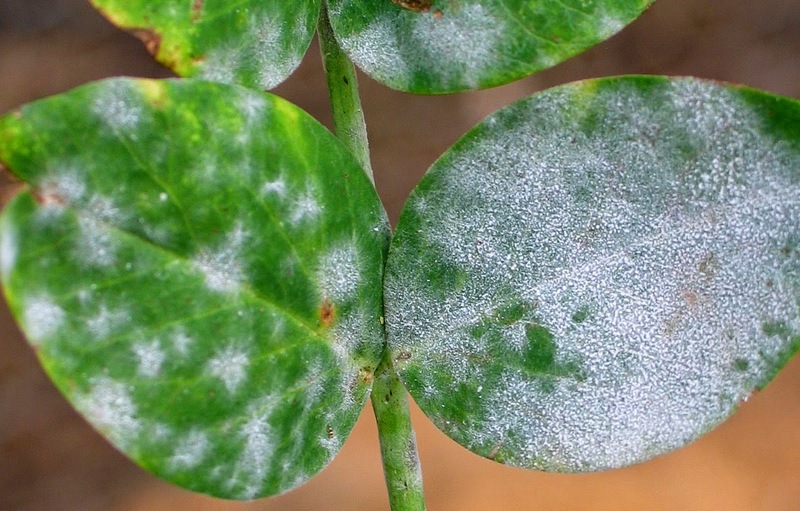 Many different types of powdery mildew fungi are host specific. This means that one particular mildew fungus will only infect those plants in a particular genus or family; the PM on the beans will not attack papaya, and the PM on mangoes will not attack tomatoes. The fungus likes temperatures between 60 and 80 degrees F and is sensitive to temperatures above 90. Cool days and warm nights favor the disease. Spores of the pathogen are dispersed readily by wind. Even though this disease flourishes with high humidity, wet leaves can actually inhibit germination of the fungal spores, thus preventing infection. Because of this, the disease should be minimized during periods of heavy rainfall. Also during this time, the numerous spores that are on the leaves will be washed away. Control – Stopping powdery mildew in its earliest stages of development provides the best control. This can be done by sanitation: remove and destroy infected parts of the plant. Other measures of control are as follows: plant in the sunniest locations, provide good air circulation through pruning, and avoid excessive applications of fertilizer. Fortunately there are a number of relatively safe and effective materials to use against this fungus - wettable sulfur, horticultural oils, including neem, and Kaligreen (potassium bicarbonate a relative of baking soda). Serenade is a bacterium and is considered a biological fungicide. It helps to prevent the powdery mildew from infecting the plant. Beware: Cucurbits (melon, squash, cucumbers) can be sensitive to sulfur. Do not apply when the temperature is near or over 90 degrees and do not apply within 2 weeks of an oil spray. Use these materials in the earliest stages of disease development for best results. Before spraying, it would help to remove the leaves that are heavily infested. Do not dispose of them on the ground since they are loaded with fungal spores. Powdery mildews can attack healthy plants; but older plants, less vigorous plants and those that are stressed are more susceptible to infection. Most important, choose plant varieties (vegetables, fruit trees and ornamentals) which are tolerant or resistant to the powdery mildew fungus. For more information about seeds from locally developed vegetable varieties, contact the University of Hawai‘i at Manoa: http://www.ctahr.hawaii.edu/seed/seeds.asp. Or, contact your local university cooperative extension office. Note: Some of the resistant varieties will exhibit powdery mildew symptoms, but the disease is less severe.